Q.1 From the pair of linear equations in the following problems, and find their solution graphically. (i) 10 students of Class X took part in a Mathematics quiz. If the number of girls is 4 more than the number of boys, find the number of boy and girls who took part in the quiz. (ii) 5 pencils and 7 pens together cost Rs. 50, whereas 7 pencils and 5 pens togeher cost Rs. 46. Find the cost of one pencil and that of one pen. Let us draw the graphs of equations (1) and (2) by finding two solutions for each of these equations. The solutions of the equations are given in the table. Plotting the points and draw the lines passing through them to represent the equations as shown. These two lines intersect at (3, 7). So, x = 3 and y = 7 is the required solution. Hence, the number of boys and girls are 3 and 7 respectively. 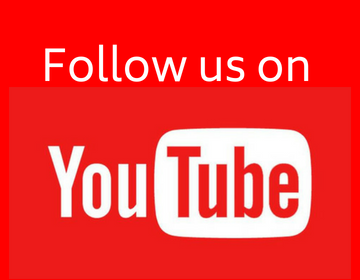 Verification : Put x = 3 and y = 7 in (1) and (2), we find that both the equations are satisfied. Let us draw the graphs of equations (1) and (2) by finding two solutions for each of these equations. The solutions of the equations are given in the table. These two lines intersect at (3, 5). So x = 3 and y = 5 is the required solution. Hence, the cost of one pencil is Rs. 3 and that of one pen is Rs. 5. Verification : Put x = 3 and y = 5 in (1) and (2), we find that both the equations are satisfied. Q.2 On comparing the ratios and find out whether the representing the following pairs of linear equations intersect at a point, parallel or coincide. (1) and (2) are intersecting lines. 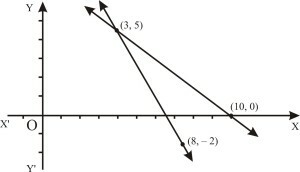 Therefore, (1) and (2) are coincident lines. 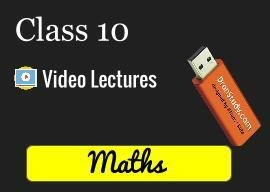 Q.3 On comparing the ratios and , find out whether the following pairs of linear equations are consistent, or inconsistent. (v) 2x + 3y = 12. Therefore, The pair of linear equations is consistent. Therefore, The pair of linear equations is inconsistent. Therefore, The pair of linear equation is consistent. Q.4 Which of the following pairs of linear equations are consistent ? Obtain the solution in such cases graphically. Plotting the points A(0, 5) and (5, 0) on the graph paper. 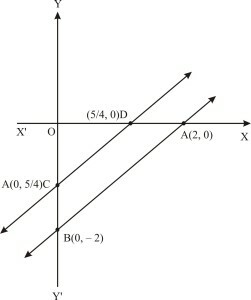 Join A and B and extend it on both sides to obtain he graph of x + y = 5. We find that C and D both lie on the graph of x + y = 5. Thus, the graphs of the two equations are coincident . Consequently, every solution of one equation is a solution the other. Hence, the system of equations has infinitely many solutions, i.e., consistent. Plotting the points A(0, – 8) and B(8, 0) on a graph paper. 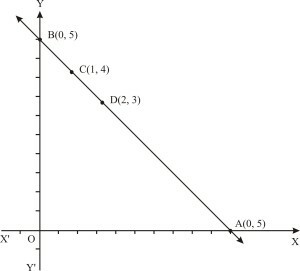 Join A and B and extend it on both sides to obtain the graph of x – y = 8 as shown. Plot the points and on the same graph paper. Join C and D and extend it on both sides to obtain the graph of 3x – 3y = 16 as shown. We find the graphs of x – y = 8 and 3x – 3y = 16 are parallel. So, the two lines have no common point. Hence, the given equations has no solution, i.e., inconsistent. Plot the points A(0, 6) and B(3, 0) on a graph paper. 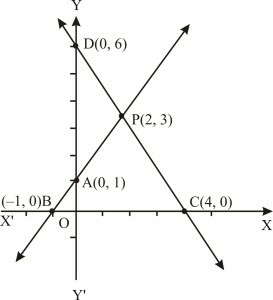 Join A and B and extend it on both sides to obtain graph of 2x + y – 6 = 0 as shown. Plotting the points C(0, –2) and D(2, 0) on the same graph and drawing a line joining them as shown. 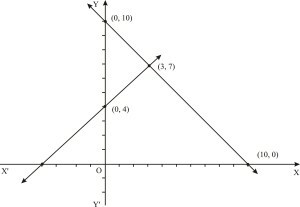 Clearly, the two lines intersect at point P(2, 2). Hence, x = 2, y = 2 is the solution of the given equations, i.e., consistent. Verification : Putting x = 2, y = 2 in the given equations, we find that both the equations are satisfied. Plot the points A(2, 0) and B(0, –2) on a graph paper. 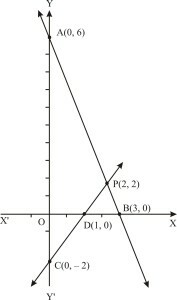 Join A and B and extend it on both sides to obtain the graph of 2x –2y – 2 = 0.
graph paper. Join C and D and extend it on both sides to obtain the graph of 4x – 4y – 5 = 0 as shown. We find the graphs of these equations are parallel lines. So, the two lines have no common point. Hence, the given system of equations has no solution, i.e., inconsistent. Q.5 Half the perimeter of a rectangular garden, whose length is 4 m more than its width, is 36 m. Find the dimensions of the graden. Sol. Let the length of the garden be x m and its width be y m.
Hence, Length = 11m and width = 7m. Q.7 Draw the graphs of the equations x – y + 1 = 0 and 3x + 2y – 12 = 0. Determine the coordinates of the vertices of the triangle formed by these lines and the x-axis, and shade the triangular region. Sol. For the graph of x – y + 1 = 0. Plot the points A(0, 1) and B(–1, 0) on a graph paper. 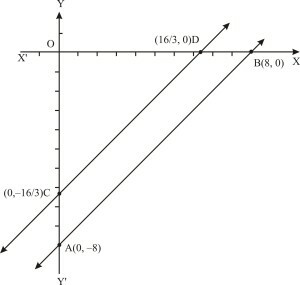 Join A and B and extend it on both sides to obtain the graph of x – y + 1 = 0. Plot the points C(4, 0) and D(0, 6) on the same graph paper and draw a line passing through these two points to obtain the graph of equation 3x + 2y – 12 = 0. Clearly, we obtain a formed by the given lines and the x - axis. The co-ordinates of the vertices are P(2, 3), B(–1, 0) and C(4, 0).